Happy Anniversary to The Solid Signal Blog! It was just seven years ago that I relaunched The Solid Signal Blog. The blog had started back in 2007, and it was pretty much like every other company blog you’ve seen. For the first few months, everyone was excited about it and then, interest waned. People found other things to do. The blog didn’t have a lot of content to keep people interested. Solid Signal, like other companies, had to tighten belts during the recession. Not only was it a tough time for the country, it was a tough time for web sites like ours. In 2009, the extremely popular “coupon-eligible converter box” program came to an end. This slowed down sales of all home theater equipment. Solid Signal was the country’s largest retailer of converter boxes, and we worked hard to find other exciting parts to offer. At the same time, Amazon was rising and retailers like us were working hard to figure out how that was going to affect us, especially in tough times. It took a little while for us to get that right, and now our Amazon store is one of the most popular consumer electronics destinations. But in the meantime, the blog suffered. You won’t find a lot of content from 2010 and 2011 if you look at the the blog’s archives. Back then we were relying on Google’s free “Blogger” platform which wasn’t much to look at. In 2012, I came aboard to revitalize Solid Signal’s social media efforts. One of the first things I did was restart The Solid Signal Blog. Seven years and close to 10,000 articles later, we are now the #1 tech-retailer-owned blog on the web with over 200,000 visits per month. We’re still the #1 destination for DIY resources for satellite TV. That’s where we started, but as time went on we started reporting on all the lines Solid Signal carries. You’ll find articles about antennas, cell boosters, computer accessories, digital signage and much more here now. We’ve also expanded to several full-time staffers and a rotating staff of guest bloggers. 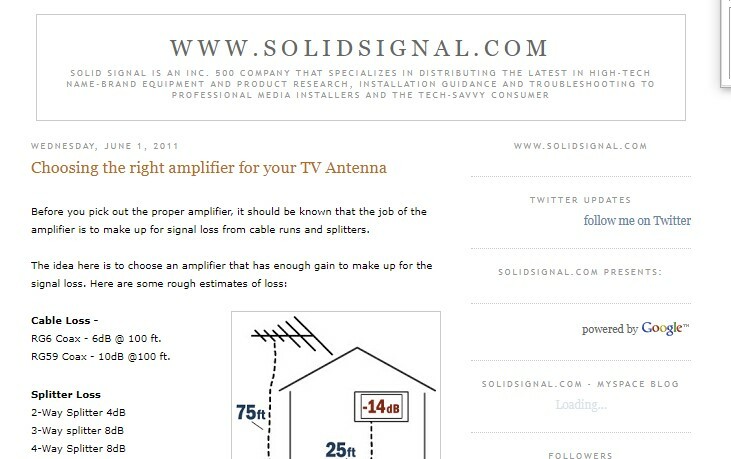 The Solid Signal Blog launches using an early version of the WordPress software. The Solid Signal Forums launched using the vBulletin platform. At the time the goal was to compete with titans of the day like SatelliteGuys.US and DBSTalk.com. The Signal Group Forums stop publishing, temporarily. 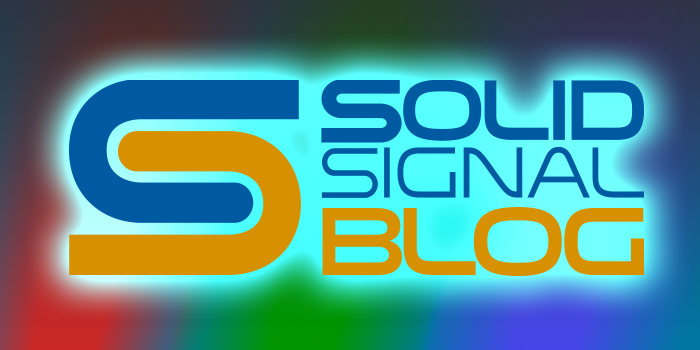 Solid Signal TV launches on its own WordPress blog. The Solid Signal Blog goes through its longest slow patch since starting. Customers demand new ways to communicate. The Solid Signal Blog relaunches on February 1, 2012 with a revitalized forum component on the vBulletin platform. It incorporates Solid Signal TV. Over 1,450 articles are published in the first month. The Solid Signal Blog is recognized as the largest tech-retailer-owned blog, hitting 150,000 views per month for the first time. TRAGEDY! We got so big and so busy that we outgrew our hosting system. Plans are put in place to move to a more robust host and move the blog back to the WordPress platform. TRAGEDY (AGAIN!) The blog transition was so successful that after only one year we had to once again migrate to a larger host. After yet another migration, The Solid Signal Blog now sits on a managed host that can handle over 500,000 views per month. That ought to keep us for a while… or maybe not? After ten years, the Solid Signal Forum is retired, and gives way to a new Facebook group. This is just the beginning for The Solid Signal Blog! Keep tuning in and we’ll keep bringing you even more of the stuff you need to know!